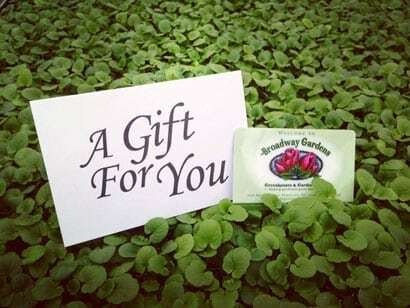 Broadway Gardens Gift Cards | Broadway Gardens Greenhouses Inc.
Our gift cards are the perfect choice for the gardener in your life! 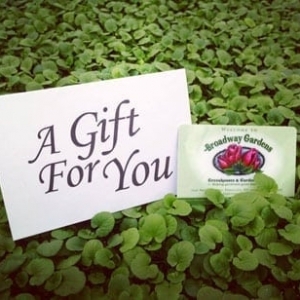 Cards are available in any amount you wish from $25.00 or more, and are valid for purchases at all Broadway Gardens locations! All gift cards purchased via our website will be sent out by U.S. Mail to the physical address of your choice. *No other sales or offers can be combined with this offer. *You can’t buy gift cards for gift cards. *Not for use on commercial accounts.